First of all happy new year to everybody! I did not blog for a while because of some personal circumstances. But now I will try to make some regular posts again. Because of these personal circumstances I cancelled my session “Hidden Gems in TFS” on the Dutch Techdays 2012. I was lined up for a session but I can not make it . In november my (Dutch) article How to deal with generic libraries was published on the Dot Net Magazine Site. 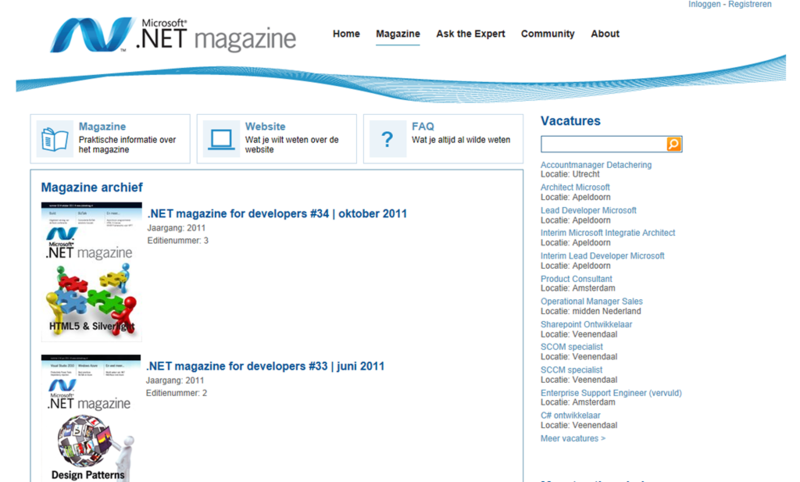 This is the site of the magazine that is published by Microsoft 4 times per year. My new year started with the good news that my article is not only published online, it is also published offline in the magazine. For the people who have a subscription to this free magazine, you can find my article on page 57 of the Dutch .Net magazine of january 2012.